We live in a world of experience, where adventurers set off to find exotic locations and have authentic experiences. They range over Tibet and Vietnam, and poke through countries as diverse as Guatamala and Turkey. With Observations of Soubré, we seek to take our visitors to an even more unusual journey: the rural villages of the Soubré region of Côte d’Ivoire. In 2012, artist and filmmaker David Hodge visited the area. After a destructive civil war, thankfully over, it remains highly isolated, walled off behind roads that are washed away, with most people having never used a cell phone or connected to the Internet. Hodge’s assignment was to document a cocoa rehabilitation project undertaken by Mars International. But while there, he also let his camera go. He took pictures of the farms, interviewed the people about their lives, and attended a class on using a machete. He came away with fascinating footage filled with everything from leisure activities and village gossip—to the very hard work it takes to grow cocoa. David, along with his wife and collaborator Hi-Jin Hodge propose taking that footage and using it to create an immersive installation. The goal is a simple one: to place people in a culture and people that few have visited or are likely to visit. And a culture which knows little of our world as well. The footage will largely be presented without editorial content. It will simply show different aspects of village life in Soubré, without making too much of them. The idea is to make us all experience this distant place, at least for a time. 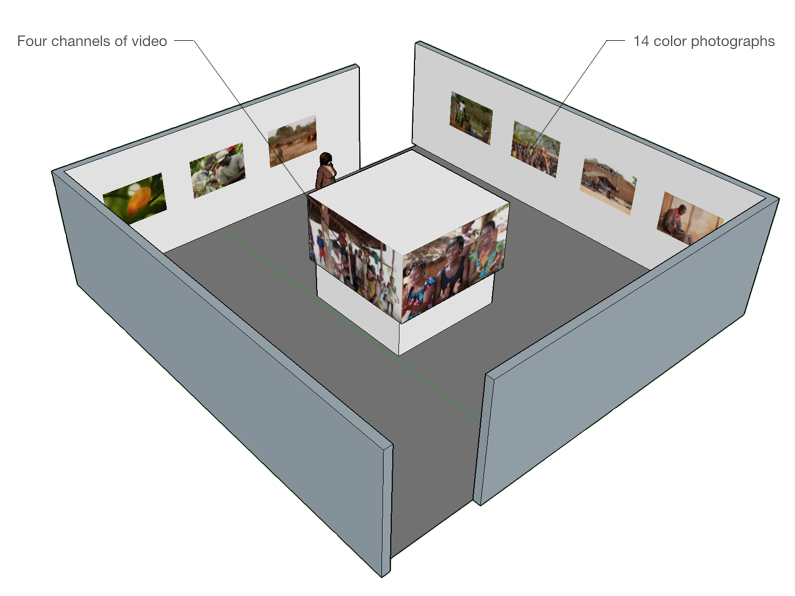 We envision four channels of video in a room surrounded by large format, high definition photos taken on the same trip. The idea would be simply to place people in a different world, allowing them to reflect on their own lives and draw new conclusions about them. Everything is done in Soubré by hand, from farming to washing. In this part of the installation, we’ll see the villages at work, and especially looking at the labor it takes to grow cocoa. In this channel we look at what do people in Soubré laugh and care about? We’ll hear them sing, gossip, talk about their lives in a frank, open way. We’ll also hear about the impact their isolation has on things like education and healthcare and how that affects them. What do villages in Soubré look like? We’ll explore their villages, homes and community centers through stunning imagery. We’ll also look at the environment around: the roads we take to get there, the wells they use for water, and similar things. In this channel, we’ll explore the villages’ dreams and aspirations. We’ll visit schools where children learn to be farmers. We’ll balance this with villagers talking about their plans for improving life now that the war is over. All imagery is filmed or photographed but not edited for this installation. We have designed an approximation of what we feel will work for the museum. However at this stage we can configure this exhibition in a variety of ways. We are willing to work with you and your technical staff to make this work for you. Once we are engaged we typically will develop a design for the exhibition. We also have a technical team who can specify equipment and program the entire exhibition if needed. We will work with your curatorial team to create the best presentation possible.